Don’t have a partner? Not a problem! One of our dance teachers will step in as your partner, giving you the advantage of learning with an experienced dancer right from the beginning. Having a dance teacher as your dance partner means never having to worry that your partner is going to stomp on your toes! You can focus on your own dancing experience without your partner holding you back or leading you astray. At William Maslin Dance Studios, we love bringing people together and we thrive on watching friendships blossom. Our activities such as group classes, evening socials and trips are a great way to meet new people and make new friends in a vibrant environment where everyone is ready to have some fun. There will always be someone ready to dance with you! Are you looking for a fun new way to spend time with your partner? Want a fun experience that you can continue to share in the future? 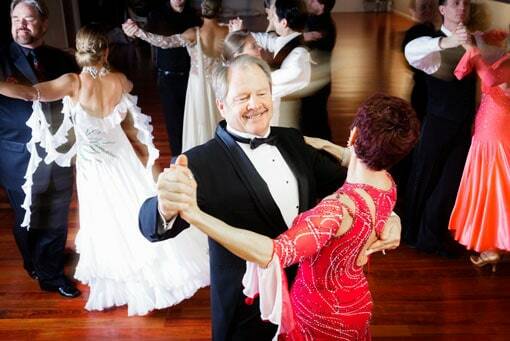 William Maslin Dance Studios couples’ classes are a fantastic way to spend quality time with your partner, while learning an exciting new skill that you’ll enjoy for years to come. Have fun learning how to dance confidently as a couple. Our couple’s classes are specifically designed for your experience and ability. You and your partner will learn about footwork, patterns, timing and balance. We’ll teach you to navigate the dance floor gracefully, so that you can dance around other couples on a crowded floor without breaking stride. Learning to dance as a couple is perfect for partners in the lead up to parties. Work on perfecting your timing and grace together, and expect to wow your family and friends at the next occasion.